WARNING: PLOT AND/OR ENDING SPOILERS FOR AVENGERS VS. X-MEN FOLLOW. As I mentioned back in my Batman Incorporated review, I’m not big on buying single issues of comic books since I usually end up buying the collected versions anyway. While that title was until now the only exception to that rule, it’s now joined by another. Over on my other meaningless site for pointless, nerd-fueled drivel, I expounded upon the annoyance I felt surrounding Marvel’s upcoming reboot and stated it was unnecessary and merely a “follow the leader” move after DC’s New 52 last year. I’d like to take a moment to break out a fork and gobble down some humble pie by saying I’d like to retract that statement – partially. As it turned out, “reboot” was entirely the wrong word to describe Marvel NOW (which I still hold is a ridiculous title more aimed at kids and ADD sufferers) since it’s more of a refresh than a complete retcon of every event over the last eight decades that bruises continuity so badly it continuously urinates red. While it did mean the end of titanic super-runs like Ed Brubaker’s Captain America and Matt Fraction’s Invincible Iron Man, it also killed off stagnant old-hands like Daniel Way’s Deadpool and Kieron Gillen’s lackluster X-Men arc. This allows almost every Marvel title to start a new series without removing continuity and creating a mindless mess of mediocre money-making. The only possible exception is Mark Waid’s Daredevil, but seriously, that run is freakin’ sweet and no refresh is needed – its recent Eisner Award wins are testament to that, illustrating Marvel does indeed know what not to start from scratch. It’s for this latter reason, and the start of Uncanny Avengers, that I firmly believe Marvel NOW is going to ultimately be better than DC’s New 52. Don’t get me wrong, I’ve loved a lot of DC’s newer stuff – especially the series’ I wouldn’t have tried beforehand – but they’ve really handled their continuity poorly in the twelve months since all their Flashpoint retcons took place. Instead of half-assedly cramming eighty years worth of story into a five-year timespan, whilst being incredibly flippant and vague over what actually happened and what was just a surreal superhero hallucination, they should’ve either really started with a clean slate or just refreshed their lines like what Marvel’s doing right now. Either option would mean a significant decrease in the level of flame warring going on right now. Five paragraphs in and I’ve barely spoken about the actual review topic, so let’s get down to it. Uncanny Avengers is the new Marvel flagship title combining the eponymous superhero team, still riding the popularity wave after April’s film outing, with some mutant mainstays from the X-Men. If you can get past the slightly awkward title (and really, I still don’t get what makes the mutants Uncanny anyway – are they in-universe doppelgangers of celebrities or something?) it’s a book that seems to be developing a slightly lighter and fluffier equivalent of writer Rick Remender’s previous titanic super-run, Uncanny X-Force. In the wake of AvX‘s game-changing finale, with the death of Charles Xavier and the decimation of the Phoenix Force, Captain America sets about creating an Avengers team blending superheroes and mutants into one big, happy gang of extraterrestrial and supernatural battle dudes. Among the chosen few are Thor, who apparently like lattes, Wolverine, who doesn’t seem to have aged a day since Joss Whedon’s run, Scarlet Witch, covering herself in red fabric almost as much as the chick from Goldfinger was covered in paint, Rogue, whose accent is still just annoying written as it was spoken by Anna Paquin, and Havok, erstwhile brother of egotist Cyclops. The team’s mission is…er, we’re not really sure yet, but since this is only one issue it’s likely we’ll find out next month. 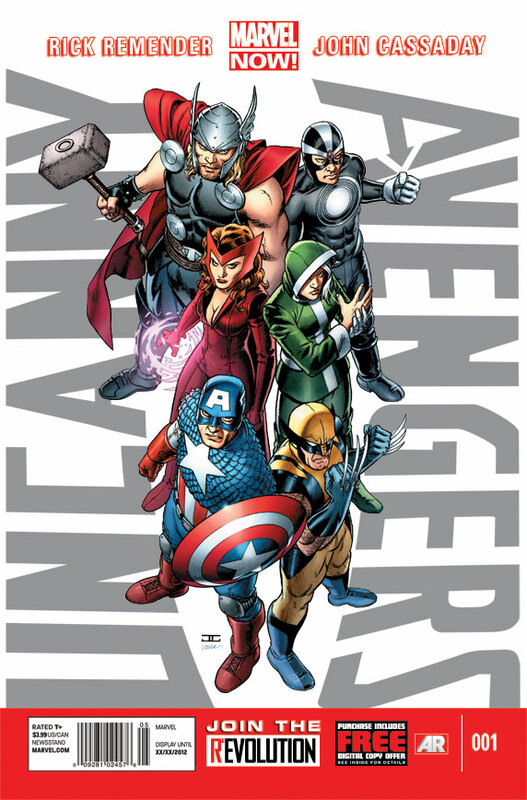 It may not exactly be an entirely original concept, but I really loved the debut of Uncanny Avengers. Instead of starting with a massive battle and the team assembled without any prior backstory, we’re given the group’s first building blocks that highlight it ain’t gonna be easy getting everyone in the same room together. The choice of Red Skull as the first main villain might seem odd, especially if he thinks he’s a threat for Thor and let alone anyone else, but rest assured that by the end of the issue it’s abundantly clear why they’ve picked him and how they’re going to elevate him to a Big Bad status to rival Kang or Ultron – if the issue’s cliffhanger pays off the way I hope it will. John Cassaday returning as an artist at Marvel really brings the book to life, and amps up the story with a synthesis between narrative and visuals in a way few artists can manage. To use a rather paltry term, it pops. God I hate that context. On top of that, Rick Remender’s dialogue is strongly reminiscent of Uncanny X-Force and is at once engaging and realistic. Both author and writer really seem to be in sync, and it makes me excited to see where this story is headed. It’s also a perfect gateway entry for any new reader, since what backstory is required gets doled out at the start and the continuity isn’t so overwhelming that newbies would feel better off reading a Mills and Boon novel instead. So if you’ve ever wanted to break into the Avengers world with what looks to be an intriguing narrative and near-flawless artistry, this is the title for you (unless you’re trying out Bendis – read his stuff first). I don’t know if I’ll review every issue as it’s released, but as something different I’ll consider it an option. If it convinces people to read the comic simultaneously, so much the better! We could start a book club and trade views on the story each month!